In an era where the term “fake news” is thrown around at a drop of a hat at ones’ “foes” to attack their personal integrity or credibility in order to push political narratives or defend agendas and conceal biases, a voice like Glenn Greenwald is truly a breath of fresh air in the public arena. The 51-year-old reporter-author, who broke the bombshell Snowden case of a joint global US and British surveillance programme in 2013 for British newspaper Guardian, can safely be regarded as one of the few media commentators with gravitas whose professional integrity is impeccable. Recently, Buzzfeed revealed a so-called bombshell allegedly proving US President Trump had ordered his then lawyer Michael Cohen to lie to Congress on Russia. Most media outlets and pundits took the story without even trying to corroborate of fact check it and run with it. However, a day after the story was out, special Counsel Robert Mueller dubbed the story completely false leaving most mainstream media outlets with eggs on their faces (once more). 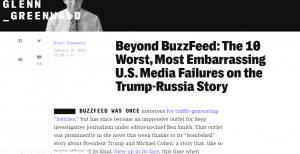 In an expose for Intercept titled “Beyond BuzzFeed: The 10 Worst, Most Embarrassing U.S. Media Failures on the Trump-Russia Story”, Glenn Greenwald lays out ten of the most journalistic failures on the Trump-Russia “saga”.